Brexit Secretary David Davis has resigned from the UK government, days after Prime Minister Theresa May secured the cabinet's backing for her Brexit plan. Here is everything you need to know so far. The long-serving Conservative MP was among the new intake when Tony Blair's new Labour swept to power in 1997. In the two decades since, he has become an established figure within the party, challenging David Cameron to a 2005 leadership contest which the younger man went on to win. He would become a key ally in Theresa May's embattled Cabinet. In his resignation letter, he blamed the “dilution” of what he said was a firm Chequers agreement, delays to the White Paper, and omissions from the "backstop” customs proposal that would leave the UK in a “weak negotiating position at best". Mr Davis said the "current trend of policy and tactics" was making it look "less and less likely" that Brexit would deliver on the referendum result and the Tory commitments to leave the EU customs union and single market. What has the Prime Minister said in response? Why was Davis important to Theresa May? Davis was described as being Britain's "Brexit bulldog", charged with leading negotiations with his EU counterpart over the country's withdrawal from the bloc. He has been noted by former colleagues for his "tough, resilient" approach. His role as Brexit Secretary was crucial to ensuring Britain leaves the EU next year with what Mrs May described as the "best possible deal". So what does this mean for the Prime Minister? Following a long weekend which started with extended talks over the country's future relationship with the EU at the Prime Minister's Chequers country pad, an agreed strategy met the backing of her Cabinet. It seemed like the most damaging line to emerge from the summit was Foreign Secretary Boris Johnson's description of the plans as a "turd". But as the weekend grew older, dissenting voices from the Tory backbenches grew louder. In short, the PM is facing the prospect of steering the country towards the biggest political junction in a generation without her captain at the helm. The Brexit Secretary was understood to have serious reservations about both the plan and whether it could be acceptable to Brussels following the Chequers summit, but was absent from the television studios in the aftermath of the talks. He has been close to the exit door on a number of occasions in recent months. 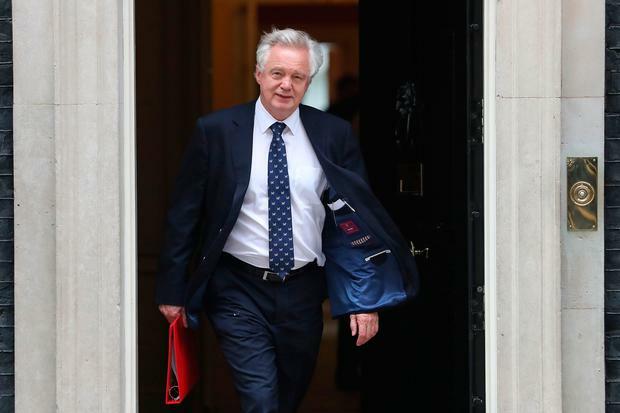 Last year reports emerged that Davis said he intended to "retire" in 2019 and leave the transitional period of Britain's exit from the European Union to Boris Johnson, something later dismissed as a "lighthearted remark". Is Davis the first of many? There was a feeling that any departure - be it immediately after the summit or once the EU made it clear Britain's terms were unacceptable - could trigger a series of resignations from the front benches, particularly from hardliners. Mrs May must be expecting others to go with Davis, and will be particularly keen to know what the likes of Mr Johnson and fellow Brexiteer Andrea Leadsom intend to do now. Brexit minister Steve Baker has also resigned. Could it get any worse for the Prime Minister? Yes. An avalanche of departures would surely trigger a leadership contest in the Tory party. Simply, if the Prime Minister cannot unite her Cabinet and convince them over the Brexit negotiations, she has no chance of getting the EU to agree to the terms.